Shri.Vishram Ramchandra Jamdar is renowned industrialist, educationist, spiritual thinker and a writer. He did his BE (Metallurgy) and is alumnus of VNIT itself. Shri. Vishram Jamdar opted to implement his professional skill in Industrial sector. His association with the Industry started way back in 1972 and had worked with more than 40 industries till now. Shri. 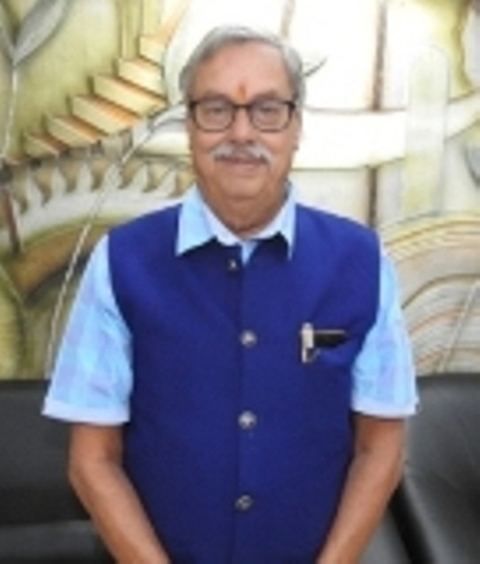 Vishram Jamdar is reputed industrialist of central India and is directly associated with ISO Certified industries namely, M/s. kinetic Gears, M/s. Garuda Yantra Nirmitee Pvt. Ltd., M/s. Mahalasa Enterprises Pvt. Ltd., M/s. HTW Industries, M/s. KG Transmission etc. The industrial exposure broadened the technical horizon which resulted in rolling out the cost effective industrial products. In spite of active involvement with industries, his association with VNIT proved to be an asset to the Institute. Earlier Shri. Jamdar was the Chairman, Board of Governors VNIT Nagpur from Sept-2014 to Sept-2017 and serving as a member of Board of Governors (of VNIT) for ten years (2002-2012), contributed in taking major decisions for the development of VNIT. His inclination for development in education sector also fetched an honour to work as a member and later as a Chairman, Governing Board of Government Polytechnic, Nagpur, for the period of 18 years. Being a President of Dharampeth Education Society, Nagpur, Shri. Vishram Jamdar had an honour to be a Chairman of Dharampeth Polytechnic, Nagpur (2010-2013). His contribution and technical excellence was acknowledged by Udyog Gaurav Award by HRD Ministry, Import Substitute Award by Defence Ministry, Best Entrepreneur of Maharashtra by MSFC, recipient of Economics of Quality Award by Quality Council of India (in SSI Category). This elevated him to the position of member of Pre Budget meeting with Finance Minister, GOI (in MSME sector). Shri. Vishram Jamdar had an honour to work as a National President of Laghu Udyog Bharti for three years and also as a member of working Group on Labour formed by PMO Office. Before taking up the responsibility of Chairman, Board of Governors of VNIT he works as Rashtriya Mahamantri of Sanskar Bharti. Crossing the borders of Indian sub-continent, Shri. Vishram Jamdar represented Indian Engineering Industries at Indonesia, represented as a Employer’s representative in International Labour Conference in Geneva (Switzerland), Lisbon Portugal and US. Also represented India as a delegate of Industrialist in Hannover (Germany). Shri.Vishram Jamdar has authored numerous snippets, articles and book on Indian Philosophy, Culture and History.